I thought I would write a little post about my health. Don’t worry, it isn’t too bad. I have had my issues with being anemic though and they flared up again in the last couple of weeks. So to start with, a little history. In April/May 2009 I went to a conference in San Diego. I got there a bit early and headed straight from San Diego to Vegas, where I spent a few days. I then headed back to San Diego for about 5 days. My life wasn’t very healthy generally back then. I guess I weighed 90kg or so, but I was training for La Marmotte so had been cycling quite a lot. If all had gone to plan, I would have been a 11h finisher (I finished in just over 8h in 2013), but it is hard to say exactly. My short stay in Vegas wasn’t exactly a healthy time either. I drank lots, I ate lots. I stayed up all night and even took an ADHD pill that was offered to me by someone who I met when I was there. It was a really fun few days, but when I flew back to San Diego I wasn’t feeling great. I remember very clearly playing pool with a colleague of mine Ed, and having to go to the bathroom. A deep black tarry mess came out and I even commented on resuming playing pool that that was the worst thing ever to come out of my body! The next few days weren’t fun. I was sweating even more than normal, just walking around the hilly streets was getting me out of breath, and I was frequently quite light headed. After getting back to England I had muscle ache pretty much everywhere. My normal 10k cycle to work was really difficult. After maybe 10 days of feeling awful, I went to the local walk-in centre because my T-shirt was moving from my heart beat when I was sitting down, so I thought I could have a heart problem. After a few tests my very dismissive doctor told me it was probably just a cold, but they would wait for the blood results. When the results arrived they showed that my haemoglobin was 9.0. That’s very low and borderline requiring a blood transfusion apparently. Multiple doctor’s appointments followed. Each was with a new doctor who had no idea of my medical history, so had no idea why I would be anaemic or what was wrong. I got sent to Endocrinology. They were very friendly, took blood and tested everything, only to ask why I was at Endocrinology, when I should obviously be at Haematology or Gastroenterology! Months passed and eventually I felt better after taking iron tablets. The doctor’s appointments stopped without them actually testing to find out the cause, but at least I was feeling better, so no harm done. In September 2009 I flew to Chicago for a holiday. Again it wasn’t a very healthy holiday, but I only drank a few too many beers and ate a bit too much, nothing Vegas-esque. Again I noticed that I had a black stool. This time I immediately took iron tablets again and felt better pretty quickly. I didn’t bother with going to a doctor, I mean in America would be crazy expensive and in the UK had been such a long waste of time last time, so I again left it. Years later when training for the Frankfurt marathon in 2014. I had been on good form. I was now living in Germany, had lost weight, was fit and hoping to break 3h in the marathon. In the summer I started increasing my mileage after doing a half distance triathlon in June. Earlier in the year I had been doing my intervals and hitting all of my times. Then I started to miss the last few intervals because they were too hard. Soon I could only manage 1 repeat at the right pace, then I gave up on intervals all together. In late August I was feeling very tired. My training was going badly and I felt like I was going backwards. I decided to visit a doctor to have a blood test. The results came back, my HGB was 11.2 and my iron was low. I hadn’t had a noticeable bleed, but I was anaemic anyway. It took a good while to get over it. I think because my iron was low, so I needed a while to build that back up whilst also making lots of new red blood cells. Anyway, I got over that and started to take iron frequently, even without any real reason for doing so, just to keep my levels up. Me and Katja went out for a run on Tuesday along the coast in Sopot. Katja, who has had problems of her own, was running at a good pace of about 5:05/km. Usually that kind of pace on flat ground would be a gentle jog for me, I would expect my HR to be 120 or so. The problem was that my HR was up at 150 sometimes, with an average in the mid-140s. My heart rate belt is getting a bit old, and often gives dodgy readings at the start, but this run felt quite difficult too. When we got back I had to go to the bathroom (a constant problem for me when running) and I again I saw what I didn’t want to see, a deep black colouration. That only lasted 1 day, but I felt pretty bad and my HR was high all the time. I decided that this time I needed to get it seen to, so when I got back home, I went to the doctor’s. It was 1 week later and I told him everything, maybe in less detail than here! He sent me for a Gastroscopy that afternoon! They didn’t find anything bad, just some redness, but no blood, no growths and no ulcers. I got my blood results back and everything was ok. By ok I mean in the normal range. My HGB was 14.0, which is in the normal range, but my normal is >15.5, so it was 10% anemic for me. Now I am waiting for a colonoscopy next week on Wednesday, and for the stomach biopsy results. I hope they show Helicobacter pylori, as then I will get Antibiotics and hopefully that will be a cure of my problems. I am not really looking forward to the colonoscopy, but I guess it is always good to know if there are problems. It would be great if everything down there is fine, and I have Helicobacter. Then a quick 1 week of Antibiotics could really be the whole cure! Imagine that, not carrying 100 sheets of toilet paper when running, and not worrying about my iron levels whenever I am in training. That would be great. I will add a post-script in the next week or 2 to add in the results as they come, but right now I am feeling quite positive about everything. I had feared that my HGB would be lower than 14. 14 is a little anemic, but without low iron should be pretty quickly recoverable. I hope next week is the end of this little 7 year long story,. I will let you know! since my initial post I have had my colonoscopy. I wasn’t looking forward to it, but the Moviprep was actually the worst part of it. You have to take this horrible tasting laxative in 1 litre of water, then wait for the explosions to start! It took over 4 hours for me, which sounds like it is more than normal. Soon enough it was doing it’s thing. The next morning I had to repeat the whole procedure, meaning I had to take a sick day at work. I was asleep for the colonoscopy itself (thank God for propofol!). I didn’t experience pain or discomfort before, during or after, but my guts haven’t been too happy since then. After the colonoscopy I was told that my gastroscopy results had shown that I do have H.pylori. As my colonoscopy didn’t find anything bad, he was a bit perplexed by what had happened. He said that my HGB had been 12.2 the week before (they took blood from me too). That sounds more likely than the 14.0 that my GP had found, as I was feeling anemic. Today I went back to my GP. It has been 9 days since my colonoscopy. He said that all my results were fine, and we could look at the small intestine using a swallowable camera, but as I am feeling better, it might not be worth it. My HGB was 13.5 after my colonoscopy still anemic, 1.3 better that 8 days previous. My iron and ferritin were low, but rising. I hope that if I keep taking iron, I will be back to 100% pretty soon. By my working I should be at about HGB 15 now, and back to normal in about 1 week. The doc was ready to send me home, saying I just need a check up in January, when I enquired about my H.pylori. He looked through my file and agreed that we should treat it. 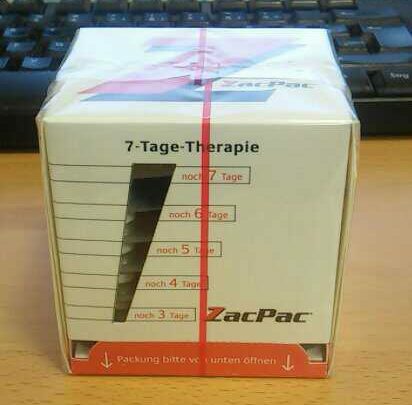 So now I have a full packet of ZacPac on my desk and I will start taking them tomorrow. It is 42 tablets, 2 antibiotics and a proton pump inhibitor twice a day for a week. As mentioned earlier, I hope it helps not only to prevent future bleeds, but also with my runner’s trots problems! I’ll check back in on the 19th when I run the Lindenseelauf 15km. Hopefully I won’t be anemic and will be raring to go by then!